New and better products, training opportunities, development of outstanding application equipment, pressure to reduce chloride emissions, and cost savings have made savvy ice and snow contractors recognize the advantage of incorporating liquid ice melt into their overall strategy. On a chemical level, there are no differences between liquid de-icers and their solid counterparts. De-icing materials all work more or less in the same way, whether they are in solid or liquid form. The ice-melting capacity and performance, however, can vary greatly. Solid ice melt effectively lowers the freezing point of water, turning snow and ice to a liquid or slushy state. The melt reacts with the ice to become a liquid brine that then can work its way down to break the bond with the surface so that the loosened ice, snow, and slush can be removed with plows. Otherwise, the brine can eventually become too diluted and refreeze. There are a few factors that determine how quickly solid ice melt will convert to a liquid form. Materials that are liquids in their natural states, such as calcium chloride and magnesium chloride, will generally revert to liquid faster. These release heat as they come into contact with ice and snow to rapidly convert to brine. Potassium chloride and sodium chloride, by comparison, are solid in their natural state and absorb heat from the environment as they convert ice and snow to brine. Liquid de-icers are already in a brine form, thus reducing the reaction time. 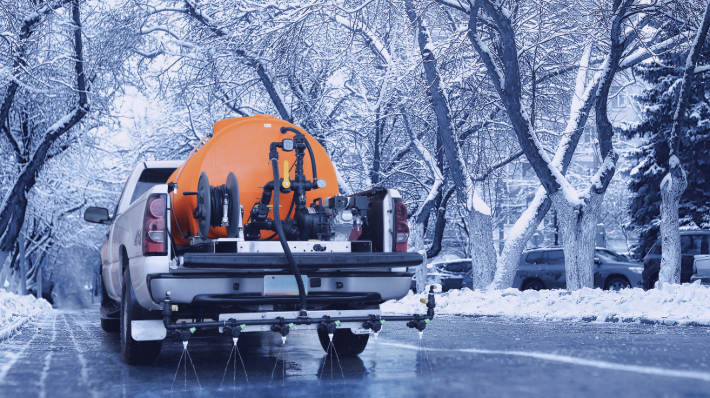 The inclusion of liquid de-icing solutions into your overall mix will help provide more time to deliver top-quality service to your clients, give you an opportunity to allocate your resources appropriately and increase your efficiencies. In the past, snow and ice management was entirely reactive. Snow and ice control contractors would only leap into action after a weather event had started, and sometimes even after it was over. That meant that ice and snow had time to get packed to surfaces and bond to the pavement, making the job of removal that much more difficult. Now, liquids allow for a proactive approach for the prevention of ice and snow accumulation before, reduction of buildup during a weather event, and then elimination after. To be most effective, it demands a strategic analysis of current and forecasted weather conditions. Chlorides (or salts) are the best-known and most popular de-icers because they are inexpensive and readily available. They include sodium chloride, calcium chloride, and magnesium chloride. Chlorides are corrosive, can damage vegetation, and are harmful to the environment. Non-chloride de-icers, such as calcium magnesium acetate, potassium acetate, urea, and sodium formate, are non-corrosive and less toxic to the environment than chlorides. They are, however, more expensive. Non-chloride de-icing solutions are what airports generally use and are excellent options for parking structures, bridges, and other environments where corrosion and environmental concerns justify the added cost. Calcium magnesium acetate and urea are effective up to 20°F, sodium formate is effective to 0°F, and potassium acetate to -15°F. Concrete is particularly vulnerable to de-icers. By lowering the freezing point of water, de-icers cause repeated thawing and refreezing of ice. When that water is trapped in concrete, which is more common in poor quality concrete, its expansion can cause chipping, breakage, and other damage. To minimize the damage caused by de-icers, it’s best to limit the volume applied and to remove the melted ice and snow as quickly as possible. Any experienced snow removal contractor worth his salt (pardon the pun) will tell you that it is far easier and faster to remove loose snow or ice than compacted ice that is frozen to the surface. Anti-icing is what allows you to be proactive when a weather event is looming. Application of the liquid to surfaces beforehand will help prevent it from bonding to the pavement by melting snow from the bottom-up. Anti-icing agents can melt approximately 1/4” of snow, providing you more time to complete the task of removing the accumulation. Since it takes as much as 5 times more salt and 50% more resources to break up existing ice bonded to the pavement than it does to prevent it, anti-icing can reduce your operating costs and boost your efficiency. Pre-wetting is the practice of coating dry salt with liquid as it’s being spread on the surface. This helps to speed up the melting process. It also helps to prevent salt from blowing or bouncing off the desired surface. This practice is also an effective way to reduce salt usage. When the snow has fallen, and the ice has formed a bond with the pavement surface, deicing is required. The application of de-icing liquid either on its own for thinner layers or with solid ice melt is an effective way to break up the ice and release the bond with the surface. This method melts ice and snow from the top down. Always plow before applying de-icing solutions. Foot and automobile traffic will help mix the material with the snow and ice, and therefore, areas with a higher volume of traffic require less material. Integrating liquid deicers into your ice control strategy will help to set you apart from other snow removal contractors. Your customers will appreciate the faster results you achieve, the lower risk of slip and fall injuries, the improved protection to lawns and vegetation, and the reduced corrosion caused by your deicing solution. They will also achieve savings because their property will require fewer repairs due to cracks caused by frequent freeze and thaw cycles. If you’re looking to add liquid ice control solutions to your strategy, you’ll need the right sprayers for the job. Ice Master Systems has a wide range of sprayers to meet virtually any contractor’s needs. It’s important to choose a sprayer with sufficient capacity to cover the required surface. Starting with the 100 gallon Liquid Master™ U Series, this truck-mounted unit is loaded with advanced features like its Time-Saver fork mounts and Easy-Adjust boom mounts, which make it easy to install and use. For larger surfaces, go for the Liquid Master™ P Series, available in 250 and 400 gallon options. If you need a pull-behind solution, the Liquid Master™ TR Series has a 250 gallon capacity. All of the Ice Master Systems sprayers boast of the Baffle-Ball surge-control feature to eliminate slosh and weight shift, a Rust-Armour stainless steel frame, the Auto-Drain sump base, and the Poly-Flex hose reel. The TR and P Series both also have the fast-fill system. We also have the brine storage solutions you need with sizes that range from 3,126 to 10,400 gallons, and our storage tanks are built tough. Each storage tank features our trademarked Ribbed-Wall construction that resists bulging. They are made from Corrode-Proof brine-compliant materials with fittings that benefit from Rust-Armor protection. Transportation is made easy thanks to the built-in anchor points, heavy duty logs, and tie-down points. By turning to Ice Master Systems for your liquid ice control storage and application needs, you will be raising the bar of service, efficiency, and quality that you provide your clients.